It's a beautiful day in Munich and I spent a lot of it in hell. 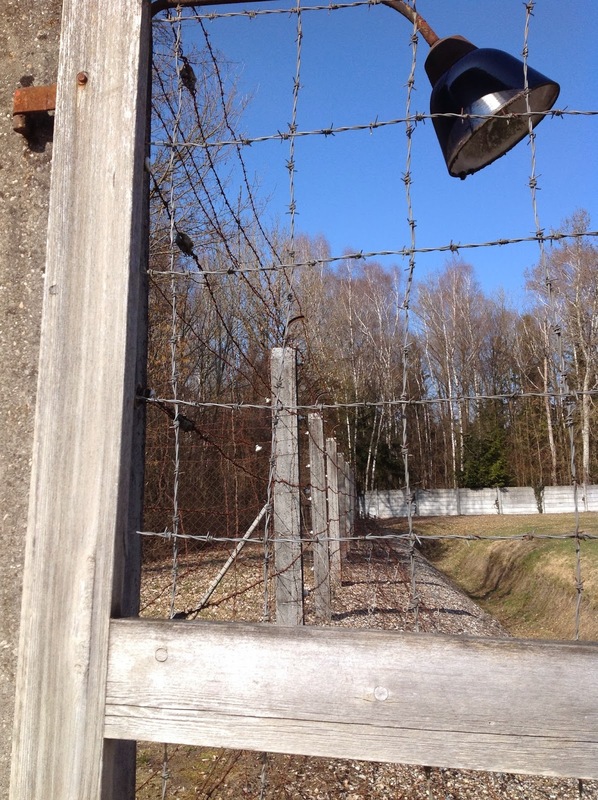 Today I made the trip up to Dachau, the infamous concentration camp that became the prototype of worse to come. First, a curiosity. 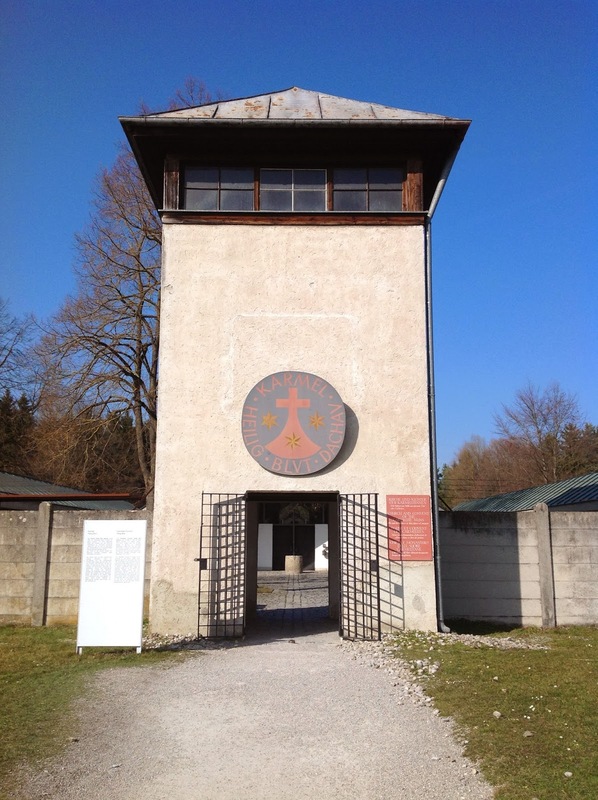 As you might imagine, Dachau was the name of the nearby town. And it still is. What to make of that? 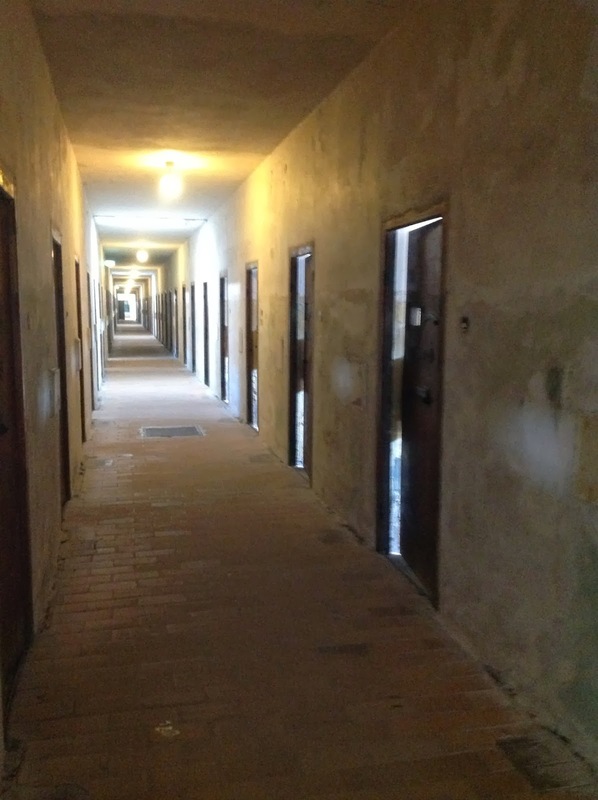 Or what to make of the fact that hard by the concentration camp, I saw residential housing? How would you like to have this conversation in your home? "Behind you--beyond your back yard." How to begin this? I almost didn't write it. 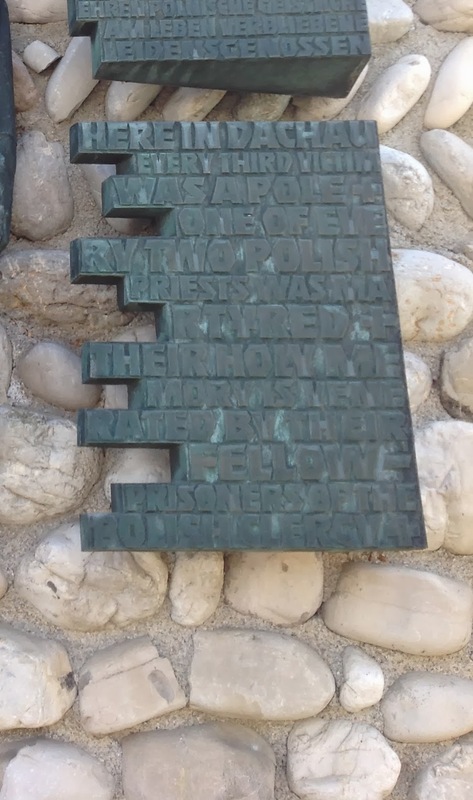 When I visited the Holocaust memorial in Jerusalem, I didn't write about it. What could I say? But I'll try to offer something here. 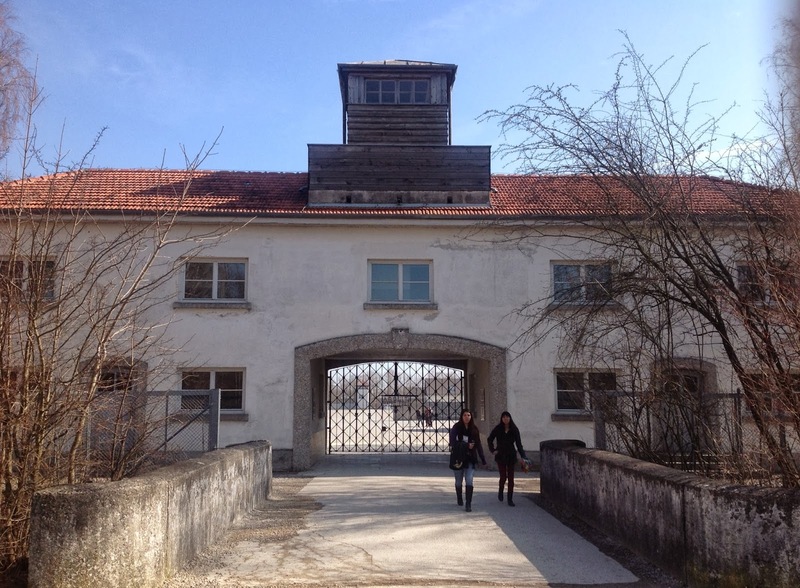 First, did you realize that Dachau was not actually a "death camp"? It was -- not to be fussy -- a concentration camp; it's purpose was to imprison and punish; and later, to provide slave labor. But it wasn't actually designed for death. That came later. Yet Dachau was the prototype. This is where the SS figured out how best to do their work. Doesn't look so bad, does it? Except that's a guard tower on top. If you look closely, you can see a door in the middle. 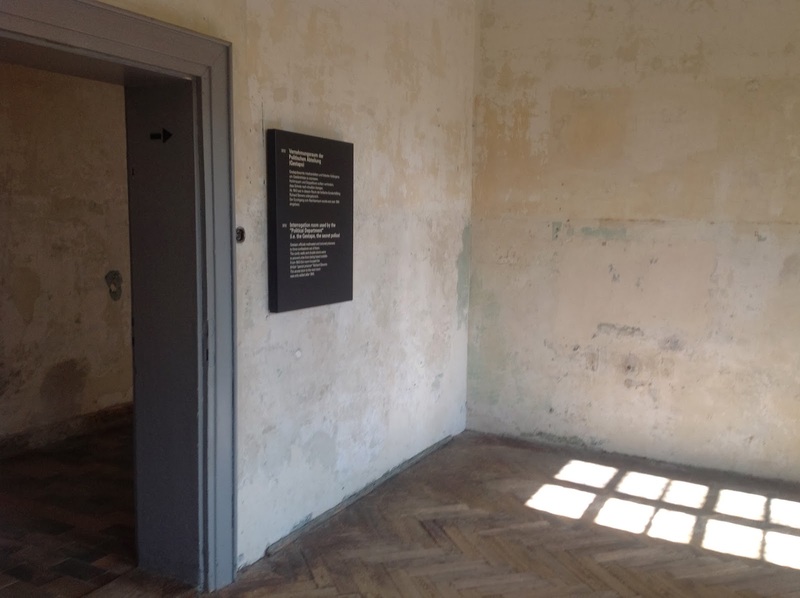 In the door appears the slogan more commonly associated with Auschwitz: "arbeit macht frei." It's hard to tell this story in pictures. The camp now is mostly empty; all the barracks are gone; two were rebuilt for display purposes, but the rest are indicated only by footprints of the buildings, and their numbers. And the buildings that are there aren't, in themselves, very frightening. At the far end one of the original buildings still stands -- dubbed "the bunker" by inmates. 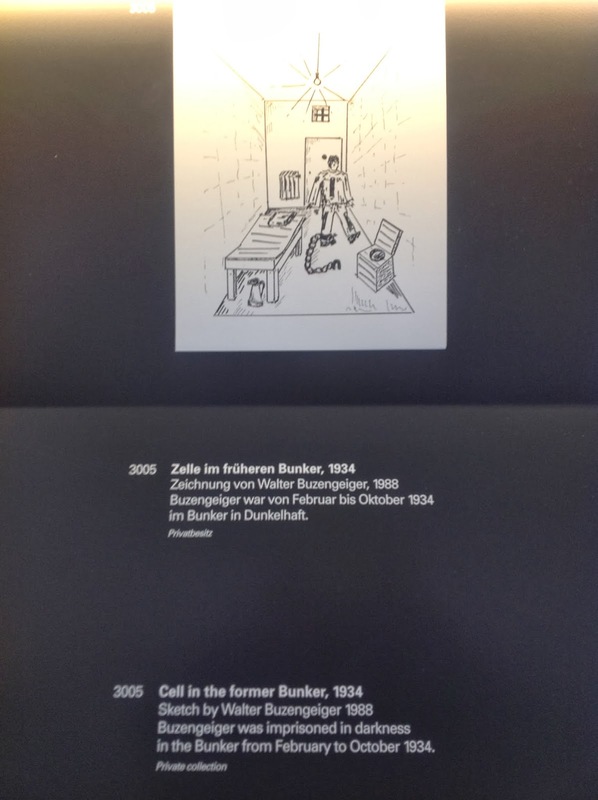 While there, I read Mr. Buzengeiger's description of having his ankle shackled to a heavy chain which was pegged to the floor of his cell; and living with that, month after month, walking around his cell for exercise, and priding himself on being able to do it without rattling his chain. 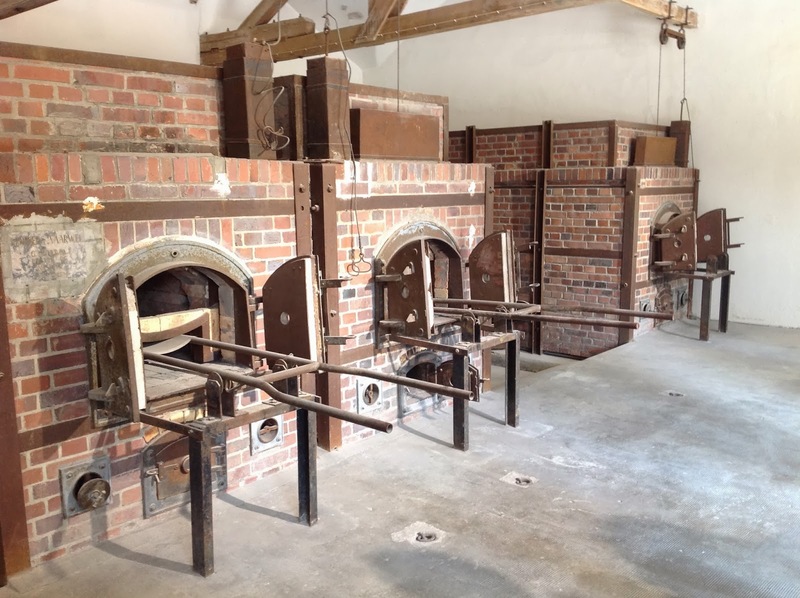 Dachau was created to house political "criminals" -- those who, for various reasons, were judged a direct threat to the regime. This was before the implementation of the "Final Solution" -- the vast enterprise dedicated to the extermination of vast numbers of people, Jews above all (but others as well). This is where political opponents were sent; religious figures who didn't toe the line; and assorted other "undesireables." That did include communists, homosexual persons, Jehovah Witnesses, probably Quakers; and it did include Roma (aka Gypsies) and Jews. Yet this was just the beginning of the horrors. The Nazis were only just beginning to learn how to be what they became. This was the interrogation room. Note the thick walls; the door was also extra thick -- to muffle noise, the exhibit said. Well, let's walk down the hall to see where the high profile prisoners -- including a lay Catholic theologian, a Catholic bishop, and a Protestant pastor. Now, if you're wondering why they got better treatment, let me add one more detail: they were allowed to be in touch with their families and friends. Get the picture now? Propaganda, I'm guessing. And, in any case, these were folks the rest of the world knew about. According to a sign behind where I'm standing for this photo, a gallows was in that corner; and that wall, to the right, is where people were executed by firing squad. 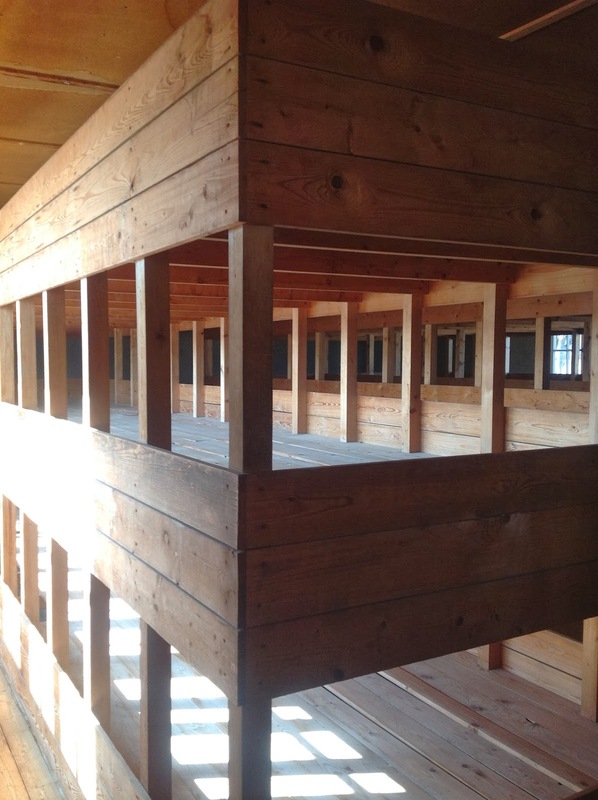 Here are bunks in one of the rebuilt barracks. Remember, thousands of men were crowded in these barracks. But what was truly awful was the people who were in charge. And it occurred to me that, while the SS men who ran the place were considerably better off, nevertheless, I can't imagine many felt anything but loathing for this experience, day after day. Remember the bunker I showed you? 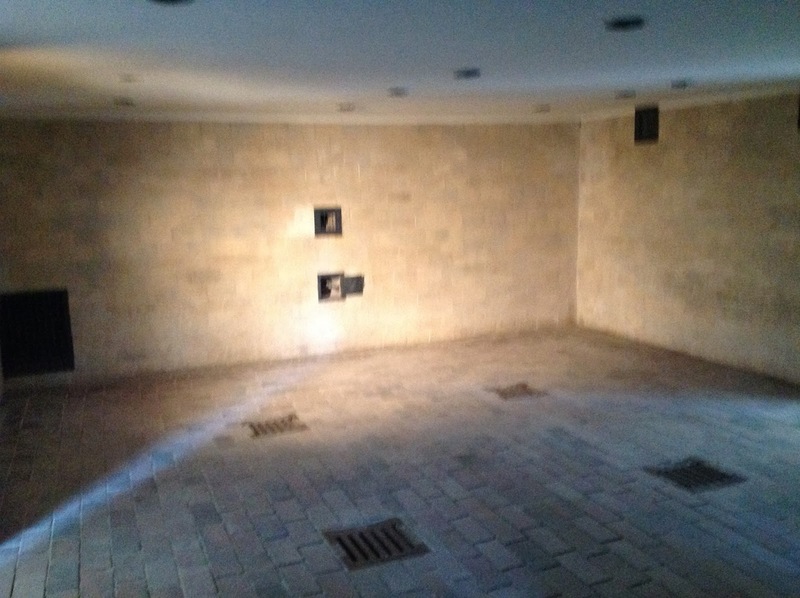 The upper half was set aside as a prison for SS members who were being punished. Punished for what? Probably the usual things; but the one thing I'll bet didn't get punished -- taking out your rage on the prisoners. At the other end is an opening in the fence, leading to the crematorium. 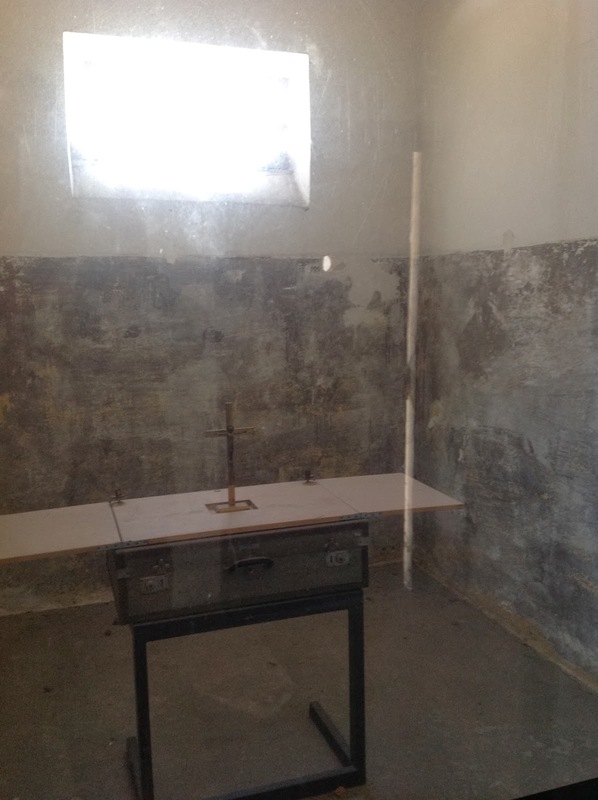 This is where the thousands of prisoners, who died from illness, infection, overwork, malnourishment, beatings, medical experimentation and executions, were taken. Of course, there was a gate. Here you can see it, as well as the fence. In the background, you can see the cement wall that surrounded the camp. Also, notice the ditch, which would slow down any escapees. This doesn't show the guard towers, and what's not clear is that the inner perimeter -- i.e., before the ditch -- was a "no-go" zone; if anyone stepped into it, he or she was shot. (Yes, there were women here too; and children.) Also, I don't think you can see the layers of barbed wire on the ground in front of the fence -- designed to entangle any escapees who got that far. Some folks would deliberately run into this area, knowing they'd be shot. According to information on site, this set up was used for some murders, but not in a systematic way. That came later in the death camps, mostly in Poland. Here are the ovens. There was one more to the left. It wasn't easy getting all my shots, because of lots of visitors. Lots of teenagers. I'm glad. 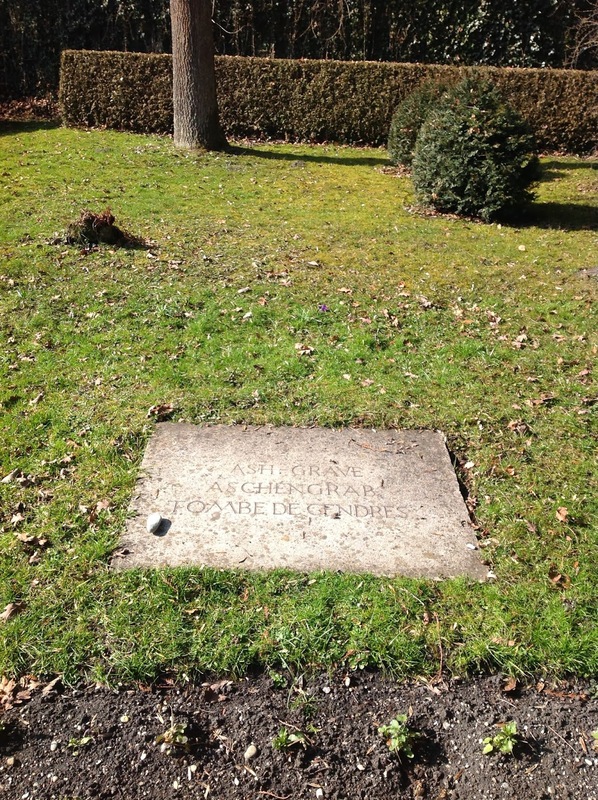 Here's one of many markers in the area around the crematorium, indicating where ashes were dumped. 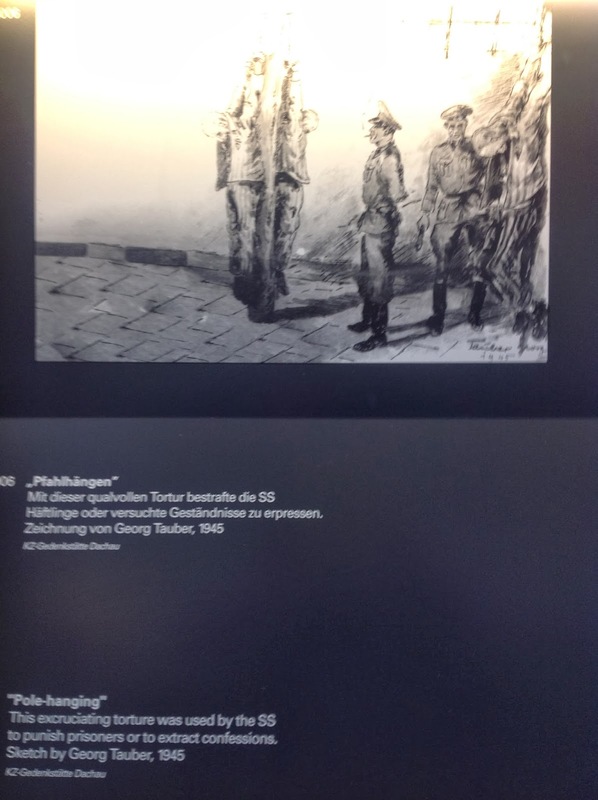 A big part of the exhibit told the story of the liberation of this camp; what the American soldiers found when they came here -- including thousands of dead bodies, and later, graves -- and the challenges of dealing with jubilant yet starving and ill prisoners. For example, you couldn't just give them ordinary food; there were a lot of miscues, until they found something that the prisoners could handle, that would bring them back to health. After a lot of walking, I sat down in this area, near these markers. No one came by while I was there. Using my iPad, I'd been praying my daily office at various points during my visit, and I prayed some of it here. And it occurred to me, that in the entire camp, this was the only place where there was any life. Here there were plants, grass, trees; and perhaps flowers in the spring. I needed that. 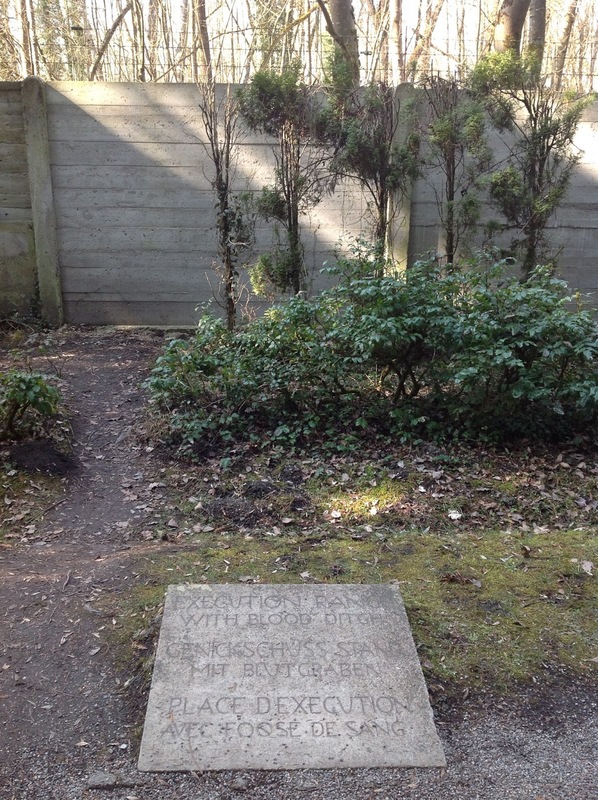 There are several religious memorials nearby. The Russian Orthodox Church erected a tiny chapel near the crematorium -- but it was locked. 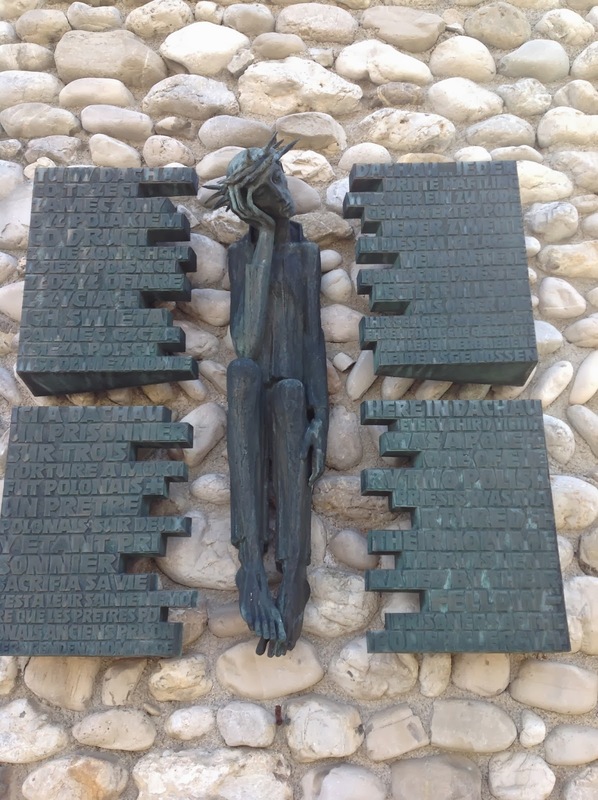 A Protestant chapel was open; after that, I visited the Catholic, "Mortal Agony of Christ Chapel"; then the Jewish memorial; these were also open. Not far beyond is a chapel. See the grey object framed in the outer doorway? That's the holy water stoup, in front of the chapel doors. I went to the doors for a visit, but I heard music from inside -- were the sisters in prayer? I opened the door slowly to find an empty chapel. Then I noticed a divide -- the sisters were cloistered; and the music was coming from the other side. After awhile, I guessed it was one sister, practicing on the organ. No matter; I came to find our Lord. I was confident the Blessed Sacrament would be here, and He was! I sat down. I cried. I wanted to cry a lot more. I wondered what the sister at the organ thought. But then, I decided this must happen a lot here. I was going to include in this post an account of another visit, in Nuremberg, to the place there that Albert Speer, Hitler's architect, had designed, and was building: a vast edifice to serve the massive rallies the Nazi party orchestrated year after year. That followed my visit to Bamberg Cathedral; but I didn't want to spoil that last post with Nazi filth. So I was going to save it for this post. But at this point, there's not much more to say. It's a fascinating exhibit, housed in the remnants of one of the never-completed buildings. I took a couple of pictures there, but as it happens, there's not much to take pictures of. You know those pictures of Hitler and his minions, marching, singing, with banners flying? They happened there, in Nuremberg. Some of it is still there, but not much. It's crumbling. 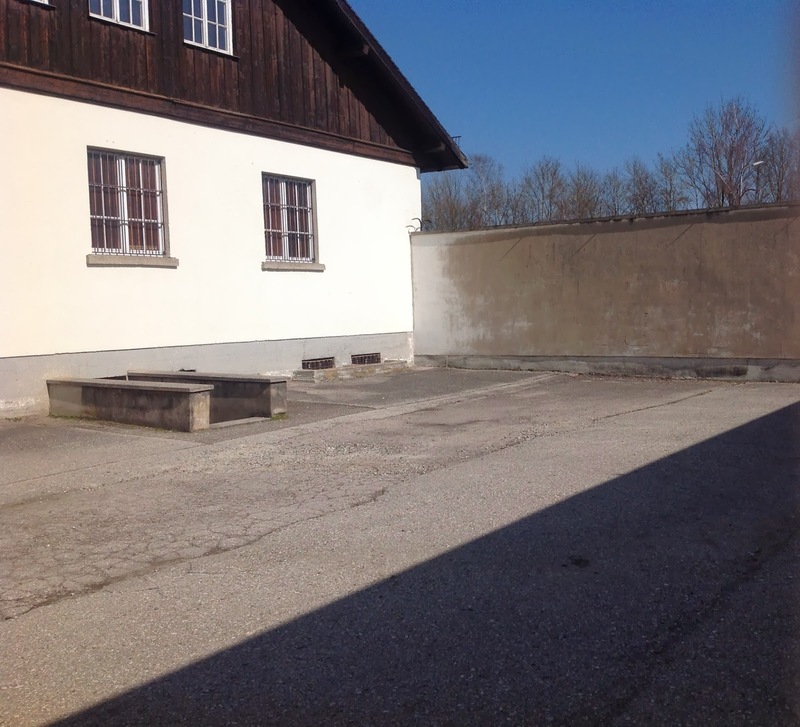 Thank you for your post about Dachau. There are no words to help us comprehend what happened there. I read a book: "Priestblock 25487" by Fr. Jean Bernard who was imprisoned there during the war. There is also a movie based on the book: "The Ninth Day." I was in a state of shock for months after reading the book. And for months afterward would arrive before dawn to my church on Sunday and police the sidewalk at the entrance - picking up cigarette butts and saying a Hail Mary with each one I picked-up. I offered those Hail Mary's for the soul of each prisoner - and after a while - for the guards and military who ran the camps. The memory of the camp does not go away. When I visited Warsaw, way back when my glorious wife, Myrna, still walked this earth, we toured Auschwitz. We humans are capable of such immense evil, and such immense beauty. Warsaw was, literally, flattened into rubble by the end of WWII. One of the few surviving structures was, ironically, a tiny synogogue. Why did you decide to title your blog "Bonfire of the Vanities?" It was fairly spontaneous. I was setting up a blog, and Blogger asked me for a title. I thought about it for about 15 seconds, and thought of one of my favorite novels by Thomas Wolfe. Let's be honest, it's men who do almost all of the killing in this world. We are the extremes. It was men who created these killing camps, and it was men dying on the Normandy beaches to stop them. La bella vita in Roma!